The exclusive club of magnetic elements officially has a new member—carbon. Using a proton beam and advanced x-ray techniques, researchers at the Department of Energy's Stanford Linear Accelerator Center (SLAC) in collaboration with colleagues from the University of Leipzig in Germany have finally put to rest doubts about carbon's ability to be made magnetic. The results appeared in the May 4 edition of Physical Review Letters. Scientists have long suspected that carbon belongs on the short list of materials that can be magnetic at room temperature, but proof of that hypothesis has languished in controversy for nearly a decade. Since antiquity, magnetism has appeared to be a trick performed only by iron, nickel, cobalt and a handful of rare alloys. "In the past, some groups thought they had discovered magnetic carbon," said Hendrik Ohldag, the paper's lead author and staff scientist at the Stanford Synchrotron Radiation Laboratory (SSRL) at SLAC. "Unfortunately, they realized later that they were misled by small amounts of iron, cobalt or nickel in their samples." Carbon's possible magnetic identity first emerged when meteorites were found containing bits of the magnetized element, but those flecks of carbon were packed in close proximity to nickel, leading to the suspicion that the observed magnetism came from the nickel. But until now, attempts to prove that pure carbon can be magnetized have remained unconvincing. "With carbon, we know how to make things very small," said Ohldag. "On the other hand we know a lot about how to process and store information using magnetism. This opens up the door for future studies that will lead to improved magnetism in carbon that could one day we will be able to combine the ‘magnetic' and the ‘carbon' world." Harnessing the magnetic properties of carbon could one day revolutionize a range of fields from nanotechnology to electronics. Carbon nanodevices could be built one atom at a time, leading to miniaturized machines and lightweight electronics. Magnetism, which forms the basis of information storage and processing in computer hard drives, could be employed in novel ways in tomorrow's electronic devices. According to Ohldag, magnetism is an "ordering phenomenon." All atoms behave like tiny magnets because of the spin orientation of electrons, he says. When enough of those tiny magnetic spins, or "moments," align, the material emanates a measurable magnetic field. 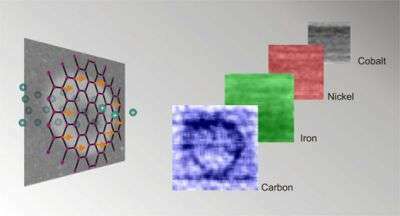 The electron spins of iron align readily, even at high temperatures, making it an ideal magnetic material. Carbon's electrons are arranged in such a way that magnetization has, until recently, seemed theoretically impossible. Carbon-containing meteorites found in 1999 challenged that notion, and subsequent research showed that transient magnetism on a small scale can be temporarily induced in carbon when it is brought near other magnetized elements. Ohldag, in collaboration with six researchers from Lawrence Berkeley Lab's Advanced Light Source (ALS) and the Institute for Experimental Physics in Leipzig, Germany, have now shown that pure samples of carbon can be made permanently magnetic at room temperature. In Leipzig, Ohldag's team applied a beam of protons to disrupt and align a portion of the electrons in samples of pure carbon, magnetizing tiny, measurable spots within the carbon. The team then used the x-ray microscope at ALS to obtain images of the magnetized portions—a measurement only possible with a state-of-the-art microscope that uses the brilliant x-ray beams generated when electrons accelerate around the ring of a synchrotron. The x-ray beam also enabled the team to verify beyond doubt that the sample remained free of impurities during the experiments, unlike the case in previous studies. "The real trick was the unique combination of x-ray techniques used," said SSRL Director Jo Stöhr. "This is an exciting result." Citation: Physical Review Letters, 98, 187204 (2007), doi:10.1103/PhysRevLett.98.187204; H. Ohldag, T. Tyliszczak, R. Höhne, D. Spemann, P. Esquinazi, M. Ungureanu, and T. Butz; "π-Electron Ferromagnetism in Metal-Free Carbon Probed by Soft X-Ray Dichroism".